A highly regarded American neuroscientist who has researched CFS for more than a decade, has decried media reports based on The Lancet Psychiatry’s recent scientific article that claims graded exercise therapy (GET) is an effective treatment for Chronic Fatigue Syndrome (CFS). The Lancet Psychiatry report, published earlier this week, is the sixth based on the now dated PACE Trials that have been widely discredited by the international ME/CFS community. Prof. J. Mark VanNess from the Californian University of the Pacific, referred specifically to The Lancet Psychiatry report’s claim that CFS patients have “fear avoidance beliefs” when it comes to exercise, and that this plays a role in “perpetuating fatigue and disability” in CFS. Most patients suffering from symptoms of ME/CFS avoid exercise, as Prof. VanNess points out in his letter that is addressed to Joan McParland, founder and coordinator of the Irish-based Newry and Mourne ME Fibromyalgia Support Group. But unlike the authors of The Lancet Psychiatry’s latest PACE article, he states that fear and avoidance of exercise is “an understandable response in ME/CFS.” They are afraid of exercise because they know that it will worsen their symptoms. “We even provide tools like heart rate monitors to help patients avoid significant aerobic exertion,” he says. This is the saddest part, because there is valid research that tells the story of ME/CFS the way it really is – but mainstream media does not appear to be listening. In the classes that Prof. VanNess teaches, students learn how the body’s major organ systems become involved in a response to exercise, specifically the metabolic, muscular and cardiovascular systems. As he states on the University of the Pacific website, it is important to have a good, thorough background in chemistry, physics and biology to understand exercise physiology. This is because when we exercise, all the major organ systems in our bodies change, particularly our nervous and immune systems. Students also learn why and how exercise is good for the body. But then there are CFS patients, and at the Pacific Fatigue Lab, the prof and his students test patients with CFS using stress of exercise. They are committed to making a difference and only last year, five of his students presented their research findings at an international conference on fatigue. Dr. VanNess and his colleagues recognize the huge physical problems that CFS patients face. This is why they continue to research the subject constantly. Furthermore, even seasoned researchers, like Prof. VanNess, don’t know why CFS patients are often not able to perform even simple tasks without becoming “fatigued.” But it might have something to do with oxygen consumption. What this means is that a positive aerobic exercise regime for healthy people could be an anaerobic activity for those suffering from CFS. This would explain why activities as supposedly simple as vacuuming the house might result in the “rapid onset of fatigue” and an often inexplicably long recovery period. 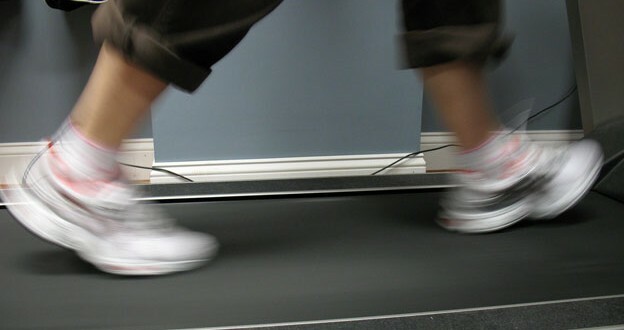 This research paper shows “significantly impaired oxygen consumption levels” in CFS patients doing treadmill exercise tests. They seem to take in a normal amount of oxygen, but can’t use it all. The three co-authors suggest that a solution might be to avoid extended period of aerobic exercise and to rely rather on short periods of stretching or resistance exercise with frequent breaks. They suggest that this would improve flexibility and increase strength instead of trying to recondition the aerobic body system. Additionally, it should reduce muscle pain, improve cognition, and provide a sense of achievement. For this reason, any CFS patient exercising should start slowly and increase gradually. But, the researchers warn, this will only be suitable for people who don’t have other health problems, and they should work with a qualified exercise physiologist or physical therapist with experience of CFS. Clearly this is something that the researchers involved in the PACE Trial Studies have failed to take into account. And the media reporting on their research studies don’t know any better! Penny Swift is an experienced journalist who has worked on daily and Sunday newspapers in several parts of the world. Her specialties include news, investigative writing, consumer, health, and medical spheres. She has written more than 40 non-fiction books mostly about construction and home-related topics, as well as decorating and landscaping. THANK YOU THANK YOU THANK YOU for doing this re: the Lancet article. It is so terribly discouraging and especially the way the media jumped it and made it sound so negative about ME and sufferers who are unable to exercise. Any chance that this article can be published where it will be seen by the general public? I am so tired of the one sided and very ignorant way that so-called science editors present ME to the public. We are just increasingly discouraged and demoralised. This is a new digital newspaper site that is open to the so-called open public. By sharing it with all your friends – and asking them to share it with all their friends – the site will grow and more and more people will be able to share the truth. You could also send links to so-called reputable online newspapers (many of which have printed media) and ask them to take note. For the record I worked for mainstream media in South Africa for decades … and the quality of work that is presented on The Argus Report is better than most. Penny, I am sorry if my comment sounded to you like I was somewhat dismissive of your level of journalism, etc. It was definitely not intended to mean that. I am very grateful to you and all the other bloggers and journalists at every level and ability who write and report on these issues. I only feel that most of the information about the seriousness of this illness is directed toward patients. While that helps us to feel that we are not alone and not misguided or mistaken in our beliefs that we are very sick, it does nothing to cause the medical professionals to behave any better toward us or to educate themselves about ME. Perhaps I am not the only one to see that the doctors and professionals such as Prof VanNess are not really being represented in most prominent media sources in a way that will be noticed. I don’t know much about medical journals or how doctors manage to see or miss research reports by the best experts on ME. I am supposing that it happens because they only look at articles pertaining to areas of their particular interest. I am in the UK, and feel desperate, as I am suffering from Orthostatic Intolerance and PEM, as well as other issues which would suggest an ME diagnosis. But, like many of us, I have not even heard of a doctor in my area who is interested, let alone knowledgeable about these things. The local clinic is run by a Rheumatologist whose research and treatment practices are focused on the so-called psychosocial model, and he treats with CBT/GET, as well as making statements that are insulting to ME patients and Fibromyalgia patients in his published articles, research abstract and by online comments from patients, he speaks in a sarcastic and rude way to patients with these illnesses. Another excellent contribution from Penny Swift. Thank you. Thank you Penny for writing this excellent piece in response to the fantastic supportive letter Joan McParland received from Professor VanNess. As others have said I would love this letter to get the coverage that the original misleading reports received. I have been sharing this on Facebook, Google and Twitter, and can report back that the responses have been very favourable and patients are delighted by the coverage you have given this issue. Thank you once again for taking an interest in our situation and getting more coverage for this issue. Thank you Penny. I hope this excellent articke makes it into main stream media. Thankyou Penny so much for supporting patients with M.E. and also for writing this true and accurate journalist piece which refutes the current false reporting in the UK using Professor VanNess’s work as a true and accurate refute of the faulty criteria put in to place by psychiatrists with vested interests that has harmed many patients. I do not have fcs, but I have fibromyalgia. The symptoms are so overlaping that I feel exactly like the others who have commented about this article. The medications I take, plus the painful nature of this disease makes exersize the last thing on my list. If not for the support of my husband I don’t know how I would survive. He even says just jump on the treadmill for a feu minutes a day. My response was that I already tried that and can t keep up at the lowest setting, anh I almost killed myself trying to get off. Thank you all for listening. Thank you, Penny, for highlighting the important work Dr. Van Ness and colleagues are doing. This was the most encouraging thing I have read in a long time. I would love to be able to benefit from exercise in the way I used to but I can’t. I know that. My body knows that. My mind & my subconscious know that. I just wish other people, especially those involved in our care, knew it too. Thank you! crass, unsympathetic and wrong approach to treatment in the UK – which has continued with even greater force since the PACE Trials . The trials in any case have been widely discredited by international neuroscientists and researchers. The persistence of the opposition by the influential medics in the UK who control the direction – and pursestrings – of the research, and their continuing vociferous advocation of GEP strikes me as subversive and wreaks of malign politicking. Let’s hope that the research of Prof. J. Mark VanNess, which adds credence to similar views expressed widely by international medical opinion, have the effect of ME/CFS research in the UK being put on a more level playing field. Thank you so much for this information! Finally I can prove to a lot of people that I’m not lazy, I really am fatigued and in pain! Thanks for information. It help me in exercises. It is nice that there are positive and sane comments on the illness of M.E. There are some basic fundamentals with the illness that make practical and functional sense. CFS is a very unfortunate term and one made up by none professionals in the late 80S and should be dismissed out of hand as its purpose was to diffuse the real illness. All it does is confuse. As it is non existent (see Byron Hyde). The problem with M.E is that it is neither a virus nor bacterium. Like Ebola MRSA and other illnesses it is most likely to be man made hence the enormous amount of subderfuge and denial at any level. In the UK and the USA they do not take notice of the WHO definition of 1969. Thew fact that this is so for me shows obvious culprability. At what point should a gov interferre with a WHO definition and for it to be swapped with psycho mumbo jumbo. In the UK the problem is that none of the 26 clinical pointers are bothered with. And blood test etc are totally inept. The illness acts like an auto immune illness, the body defending itself, but in doing so making matters worse. Defence proteins attache themselves to blood cells as is there normal function, however because the illness is not recognizable and the proteins dont work. So they send more in a never ending circle. The defence proteins block oxygen transference to the cells , and thou extra oxygen may show up in the blood, the body cant use it. Thus a body with insufficient oxygen is not a happy bunny. It is no differtent to a mountain climber on the last 400 yards of everest, they are very fit people but it takes them all day to do 400 yards. Now you are in the realms of m.e. So trying to get someone with m.e to do exercise is the same as trying to get the climber to take someone on his back and having some one say, come on your not trying. That someone would be an idiot. The main difference with the climber and the m.e sufferer is he cant come down the mountain and every day is the same. Eventually the body will give up, thats why exercise is damaging in the extreme can kill, has killed and is stupid in the extreme. Anyway thats that off me chest. Oh and well done for the article. Many Thanks. Paul the WHO definitions are about to change … and those changes are even more scary! Since you last wrote there Penny on June 11 have the WHO definitions been changed? and to what, sorry I have ME and try to keep up but do fail, so would really like to know. Many thanks for the above article Penny. Have a look at Suzy Chapman’s comments here. She has her finger on the pulse. I will follow up as soon as I can. Thank you, thank you, thank you and God Bless you. May your report be followed up by those who treat us and mos who don’t believe us! I am lucky I can walk. I have had FM for 31 years and attended the Chronic Pain Program at St Paul’s Hospital in Vancouver BC. The physio introduced a very personal exercise program for each person and it was amazing to see how people so debilitated (including myself) improved. I totally disagree with this article. I think exercise based on each individual’s capacity is one of the best ways of improving our health and lessening pain. As a longtime sufferer I have tried many many cures. Hiking slowly in nature is amazing. I can now hike for 3 hours very slowly on fairly level terrain. I find the exercise, fresh air, and natural environment improve my oxygen consumption, my health and my mood. I feel better the next day and it has taken 7 years to be able to comfortably hike for 3 or 4 hours. If I am in a flare, of course I can’t hike. But I do swim or hike regularly and both these activities have improved my FM. I am sure it varies from person to person. However I feel movement is part of being alive, and encouraging people with CF or FM to be fearful or activity is not positive.